In this category, we suggest that you start with learning how to make your own jungle gym. Even if you’re not planning on digging out a hammer and some lumber, reading about the process is educational. It’s likely that you’ve never considered making your own backyard playset. It’s easier than you’d expect. For those who don’t want to construct a playset for their kids, we have plenty of articles for you. 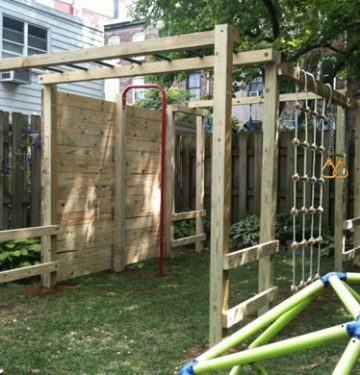 If you have the space in your backyard for a playground set, you’ll want one that keeps your child occupied for hours. It should be big enough for a few kids, so that friends can enjoy it, too. You’ll be able to keep an eye on your child when everyone in the neighborhood enjoys coming to your house. You’ll be able to monitor your kids’ as well as their friends from your own home. That’s vital today when you don’t know how other families supervise their own children. Playing outside is vital for a child’s physical development. Tactile learning can be achieved with some jungle gyms, too. That might be surprising to learn. There are swings, slides, and monkey bars. There are also areas where kids can learn, too. Some playsets have games like tic-tac-toe. Ultimately, a playset has dozens of activities that will keep your kid entertained for hours. We have plenty of reviews on the site for you to find the playset that’s perfect for your yard and family.